This book deals with the lives of several generations of a family beginning in the 1940s in Lyallpur, continuing through the troubled time of Partition and moving away from their ancestors’ home as staying there becomes too dangerous. The second part follows the recently married daughter Tara and her husband Seva Ram and their son Arjun as they make their life in Simla and the final part of the book follows a grown-up Arjun and his later life and marriage. One of the most prominent themes in the book seems to be dissatisfaction and also as appropriate for the time – being carried along in the fast flowing current of history. The book is certainly worth a read – the characters are interesting, though I personally didn’t find them particularly agreeable, and it is a fast paced story, with the end being a little bit rushed compared to the rest of it. But it’s all a little unexpected – you think you know what will happen, and it will, but there’s always some kind of twist to it… It’s quite poetic. 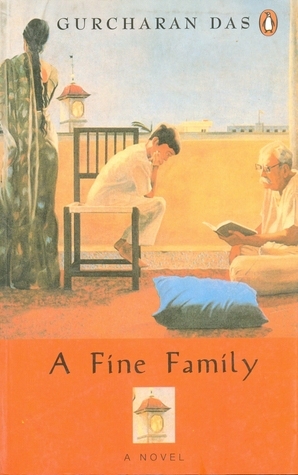 This entry was posted in Fiction, Indian literature and tagged A Fine Family, book review, books, Gurcharan Das, India. Bookmark the permalink.